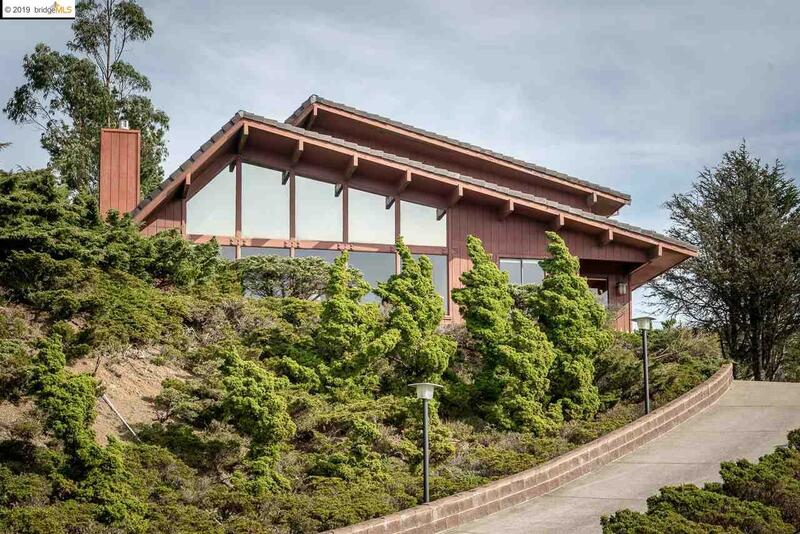 Custom-built Modern home with gigantic views sits elegantly atop the El Cerrito hills! This four-bedroom, three-bath home enjoys 3-bridge views for as far as the eye can see! In a beautiful location near schools, Arlington Park, Wildcat Canyon, Tilden Park, Berkeley Country Club golf course, and approx 2.5 miles to two Bart stations. Open floor plan with wood-paneled living room, dramatic wall of windows & soaring beamed ceiling. Master suites on each floor. Second floor suite has big views of SF, bay, & beyond, which can be appreciated from inside or the deck. Large kitchen perfectly located for entertaining. Home has private side patio and charming front sitting area. Zoned for highly-rated Madera Elementary School, buyer to verify.